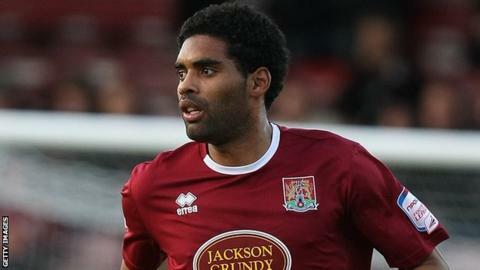 Plymouth Argyle have signed Anthony Charles until the end of the season after the defender had his contract terminated by Northampton Town. The 31-year-old made 20 appearances for the Cobblers, including 11 this season, after agreeing a one-year contract with the League Two club in May. Argyle also signed Reading's Gozie Ugwu on a month's loan on Thursday. The 19-year-old has spent most of this season on loan at Yeovil Town and scored three goals for the Glovers. Speaking about Charles's departure from Sixfields, Northampton manager Aidy Boothroyd told BBC Northampton: "I think we've got better centre-halves and it's only right that you tell them nice and early. "We wish him well because he did a job for us last year and he's done a job for us for parts of this year. "Anthony has never let us down [but], being honest with him, he was going to find first team opportunities limited moving forward and he was not going to be offered a new contract here in the summer. Charles has been used at left-back but always looked more comfortable in the centre. He should have no problem finding another club. David Artell is very close to a comeback from injury. As for Hornby, he has impressed hugely since getting his opportunity in the first-team. "Hopefully, he'll get to play more regularly elsewhere. I also feel we are top heavy on defenders and we need to look to strengthen further up the pitch." Charles played 180 games for Aldershot between 2007 and 2011 and also includes Farnborough, Crewe and Barnet among his former clubs. Meanwhile, Lewis Hornby has signed a two-and-a-half year professional contract with the Cobblers. The 17-year-old midfielder came through the club's academy and spent time on loan at Kettering Town last season. He has made 14 appearances for Northampton's first team this season. "Lewis deserves his new contract," said Boothroyd. "Just like Dean Snedker, he has made excellent progress and the challenge he has now is to continue to develop. "He has already made a good number of appearances for a player so young, and we are really pleased to have his future sorted out. "This is another big pat on the back for our Academy, who are producing some excellent young players. "Young players know that by coming to Northampton Town not only will they receive excellent coaching, but there is a clear pathway through to our first team squad."